Like my review of Hogshead a couple weeks ago, TRVE quickly reminds us how important small neighborhoods are within our ever-growing Metro Denver to foster our feelings of community and to strengthen our ability to enjoy local products. Located on Broadway in the Baker District just north of “SoBo,” TRVE keeps their beer menu simple. Their entire approach is best understood by reading the link about their vision on their website. 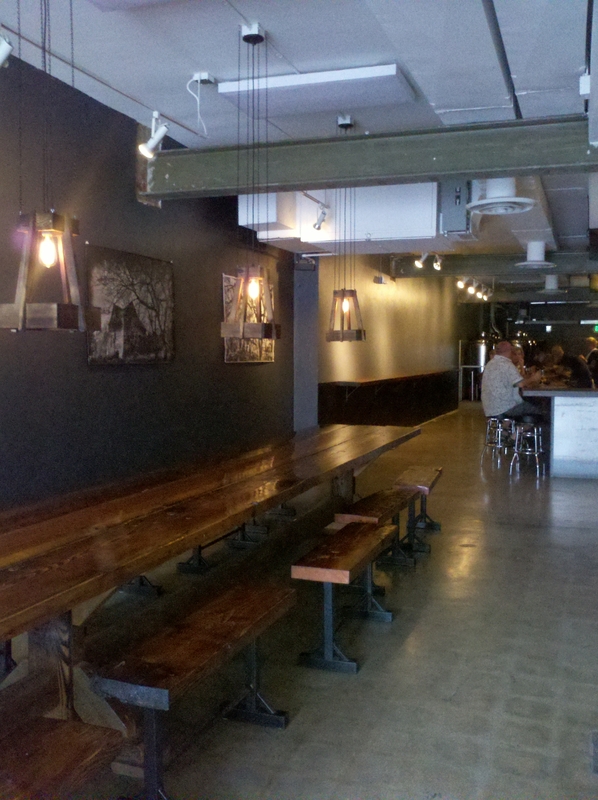 We enjoyed all three beers on tap at TRVE’s custom, picnic-style table that reminded me of a scene from Beowulf. I think this table might hold the World Record for the largest continuous table. And if it doesn’t, it should at least win an award for its beauty, craftsmanship, and inherent ability to build community. The rest of TRVE’s decor also stands out as unique: a long and narrow tap room and bar, and black walls that offer a perfect backdrop for the erie photos of Eastern Colorado and Kansas, mostly capturing old houses and cabins, (strikingly similar to Dorothy’s home in the Wizard of Oz before the munchkins and technicolor appeared). Tasty beer, distinct character, and a community feel make True a must-visit brewery while exploring Denver’s beer culture. From TRVE, head-up to Lo-Hi (Lower Highlands), just west across I25 from downtown. Here you’ll find Prost, with a beer garden and a view of the Denver Skyline that could have easily landed it in several of our Beautiful Breweries posts last month. With a focus on German styles, Prost seems eager to keep their tap offerings to five beers, three regulars and one rotating, along with a regularly changing guest handle. Like many of the breweries we’ve reported on recently, Prost exemplifies the communal aspects of the micro-brew industry: they are currently contract brewing for another Denver brewery that can’t quite keep up with production; they offer a multitude of picnic tables, inside and out, allowing both small and large groups to gather, and to share a spot with complete strangers; and they’ve included a room separated from the main area by glass windows that invites groups to gather for special occasions and Friday night festivities. This is a spot to seek out your favorite German style and settle in for a fun time with friends or a long loitering gaze towards downtown Denver. I’m more than glad to do both. This entry was posted in Beautiful Breweries, Craft Beer Adventures, New Breweries, Tasting Highlights: Breweries and tagged Beer Community, Denver Beer, Denver Skyline, Prost Brewing, True Brewing, Views of the Denver Skyline. All of us here at Prost Brewing want to thank you for the wonderful article you wrote about us. Come visit us again soon! Glad to write it . . . looking forward to that Pilsner and vista!